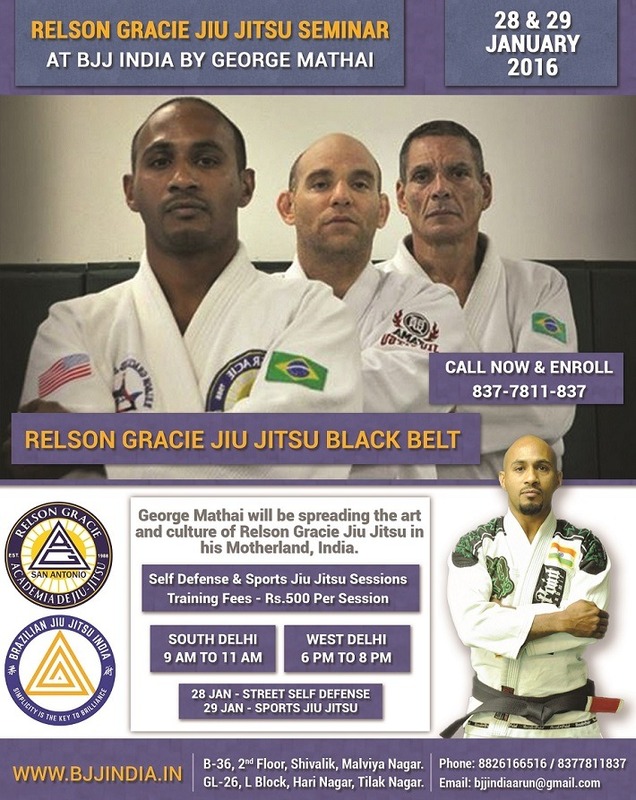 Relson Gracie Jiu Jitsu India Seminar, By George Mathia – Black Belt in Relson Gracie Jiu Jitsu. George will be teaching a 2 Days Seminar at BJJ India covering Street Self Defense and Sports Jiu Jitsu. 9 am to 11 am – South Delhi – Malviya Nagar Branch. B-36, Shivalik, Second Floor. Above D-Pauls. 6 pm to 8 pm – West Delhi – Tilak Nagar Branch. GL-26, L Block, Hari Nagar, Jail Road. Seminar Fees – Rs.500 Per Session. Visit BJJ India Contact Us Page.